Description: Yola is a European-American treasure in Media, Art, and Humanitarian accomplishments who will warm your heart and bring a positive and intelligent spin to life, on her “The Yola Nash Show!” Refreshing and exciting, “The Yola Nash Show” gives listeners and viewers exclusive access to intimate conversations with fascinating guests: from A-List Celebrities, to Entrepreneurs, World-renowned guests…even Poets! In her exciting career in media she has interviewed the world’s biggest stars and renowned personalities: Billy Joel; Kevin Bacon; Howie Mandel; William Shatner; Melissa Etheridge; Fran Drescher; Chris Botti; Barry Manilow; Seal; Priscilla Presley; Courtney Love; Michio Kaku; Neil deGrasse Tyson; The Dog Whisperer, Cesar Millan; Lech Walesa, Nobel Peace Prize winner and former President of Poland; Michael Bloomberg, former Mayor of NYC; James McGreevey, Governor of NJ; George Pataki, Governor of NY; Oscar, Golden Globe and Tony winning Broadway stars Benj Pasek and Justin Paul - just to mention a few! 6/10/18; Grammy & Oscar Winning Superstar Melissa Etheridge & Emmy-nominee Nat Geo Wild Star Cesar Millan. 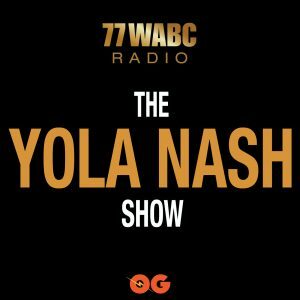 Yola Nash interviews Author Joyce Smith & Sports Stars Eric Kussin (NJ Devils, FL Panthers) & Eric Kelly (National Boxing Champion, USA Olympic and Golden Gloves Boxer).